People with scoliosis are subjected to a great deal of X-ray radiation over the course of their lives, significantly increasing their risk for breast cancer. A year ago, I wrote a blog introducing thermal body scans as a potential alternative to these X-rays and I received tremendous response on this topic. It made me curious as to what my own body scan might show, particularly as I had surgery just a few year ago to remove an 8 cm cyst from my abdomen (a story that I also detailed on this blog). A few months ago, I made an appointment to have my first full-body thermal scan, just to make sure I didn’t have anything else hiding in my body. A thermal scan is different from an X-ray in that no radiation is used. Instead, the scan shows areas of the body that are giving off heat. These scans are taken with a heat sensitive camera and usually indicate any inflamed organs, cysts, tumors and overworked muscles – areas that may need further investigation. You’ll see a variety of colors when looking at a thermography image – the brighter the color, the more inflamed the tissue. The colors indicating heat span from green (low heat) to bright red (high heat). Dark colors, like maroon, purple and blue indicate little to no inflammation. Thankfully, my thermal scan indicates that all is well, but I was very surprised to find out that my scan also colorfully illustrated my scoli! In my thermography picture, green is my brightest color. If you follow the green color down my body, the issue areas are mainly upper left neck, right shoulder and mid back, lower left back and far-right hip – all which map my scoli perfectly. Now, I’m not saying that thermal scans can completely replace X-rays, but the similarities are there, both in color and black and white. Could incorporating thermal scans rather than X-rays into your follow-up scoliosis appointments reduce your risk of breast cancer? Maybe. And that’s something to seriously consider, right? Let’s get back to examining what thermal scans reveal. The beefier (more colorful) muscles generate more heat because they are the workhorse muscles of the body. In scoliotic bodies, those muscles are overworked because they are attempting to hold up the body from sinking deeper into the scoliotic curves. Those same convex muscles are long and overworked. One might assume that you should strengthen those muscles to help them better carry the bulk of the weight; however, it’s the opposite that’s true. Consider this: If I worked the convex area of my curves to strengthen those muscles, what color would my already green-colored tissue most likely turn to in a thermal scan? It would start turning light blue, then yellow, possibly all the way to bright red. Is that good or bad? It’s bad, because it indicates that the tissue is overworked and inflamed (to find out which is the convex vs concave part of your scoli, click here). To help correct my scoli, I need to balance out my muscle tissue, i.e. balance out the colors in my thermal scan. I should be strengthening the muscles in the concave part of my curve, not the convex. Take a look at one particular part of my thermal scan, the biggest section of green in my right ribcage area. Now, go directly to the left side of the spine to the green area. See that almost perfect triangle of green there? This is a good thing! I’ve purposefully been working my trapezius and rhomboid muscles to pull my spine back to the left, moving my spine towards neutral. That is what’s helping to stabilize my spine. One final note on thermography for scoliosis: remember that widely-debated side plank research that was published in 2015? The research indicated that a specific side plank could help with scoliosis. To refresh your memory, you can read my thoughts on it here: 1, 2, 3, 4, and 5. I’ve argued about this study with people all over the world and I’m convinced that the research incorrectly assesses which hand to use for the plank according to your particular convex/concave curves. If I did the plank as that research suggested with my right hand down, I’d be increasing the muscle tension in my mid right back. Per everything we’ve just learned about my thermography scan, would that be a good thing? No! We don’t want extra heat in the body, we want it to calm down and have a more even distribution of existing heat. So, this is a lot to process. I encourage you to do your own research and find out for yourself. 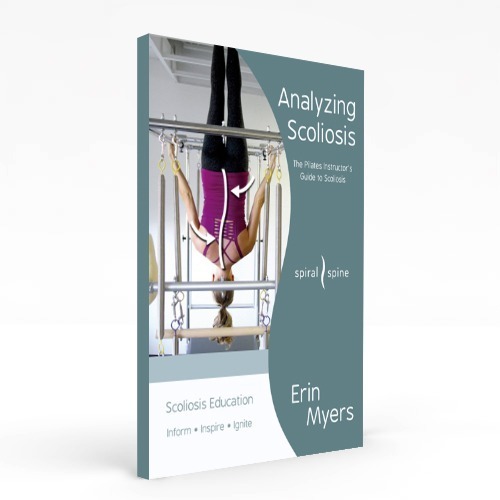 Go get a thermography scan and see what living-color proof you find out about your scoliosis. The Spiral Spine community would love to hear your results!